Farm Why We’re Starting a CSA and You Should Too! Have no idea what I’m talking about? Don’t worry I gotcha covered! A CSA or community supported agriculture is a program where customers essentially invest in a farm. They pay upfront, at the beginning of the season helping farmers to purchase supplies and pay bills. For their investment they receive “shares” of products throughout the season. 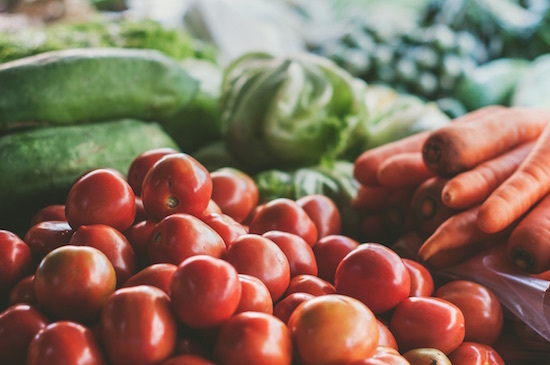 The customers get produce at the peak of freshness, a discounted rate, and an opportunity to get healthy food close to home. The farmers get paid when they need it the most. Everyone wins. For our CSA we’ll be starting small. Our goal is to sell 10 shares (I think we’ve already got 2) at $160. We’ll provide our customers with a once a week share for 8 weeks during the upcoming growing season. Our shares will be comprised of vegetables, herbs, eggs, bread, herbal teas, and other goodies! 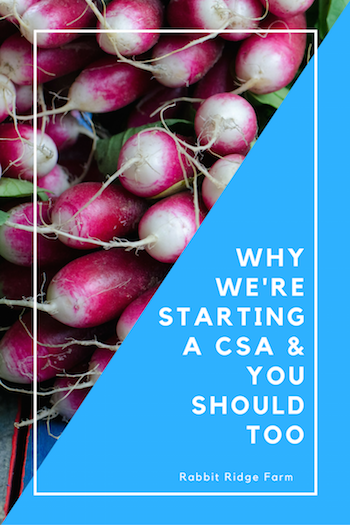 There are several reasons a CSA can be great for any small farm. You know exactly how much produce to harvest each week. There’s no chance of putting all the work into harvesting and packing only to have the market rained out. You’ll build a relationship with customers, especially if your CSA is small. People are much more likely to chat with you when there’s just a few people than if you were at a large market and getting to know you will make them more loyal customers in the future. If you want to try growing a new crop you can use your CSA members for feedback. Add your new product to their box as an extra and ask for their opinion. They’ll probably be happy to help! There is no rule that says your CSA can only sell vegetables or that it even has to sell vegetables at all! Own a sheep farm? Do a fiber CSA for avid knitters and spinners! Are you an awesome herbalist? Sell wellness CSA shares and distribute your favorites teas, tinctures, and salves. Seriously you can do this. In fact there’s no rules that say you have to have so many members or have a specific size share or timeframe. All you have to do is come up with what you want to sell, when you want to sell it, and how much of it you want sell and charge accordingly. Easy peasy (just kidding farming is never easy cause now you have to make sure you deliver on that promise to your customers. Some CSAs trade some of the cost for customers’ work on the farm. If you need a little extra help you could work out a similar arrangement with your customers. You can partner up with another farm or organization. This allows you to offer more products, ensure your customers get what they paid for in if you have a hard season, and potentially get more customers. Your customers pay before the season starts. This allows you funding to purchase seasonal supplies like seeds, soil amendments, replacement drip tape, etc. If you need more information about running a CSA I recommend this article from Modern Farmer. It includes links to tons more resources too. Want more info about our CSA? Shoot me an email at rabbitridgefarmwv@gmail.com or message us on Facebook or Twitter.